This past weekend’s Postural Respiration was held at Quinnipiac University, at the Frank Netter School of Medicine, where many of his iconic, albeit symmetrical, medical illustrations line the hallways. 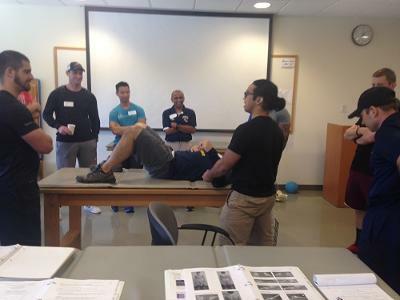 We had a lively mix of PTs, ATCs, and SCSs, most of whom had at least some exposure to the PRI paradigm and were eager to develop a greater understanding of the science. Mainstay characters, such as little Russian boy, Charlie, Owen, the Chain Smoker, and pec-man illustrated how loss of alternating, reciprocal movement, from improper training, incomplete integration of primitive reflexes, or habitual, uni-dimensional postures contribute to a vicious cycle of compensated, sub-optimal breathing in an attempt to get air, leading to even greater compromise in breathing. Much time was devoted to getting hands on rib cages, securing a zone on the left, and guiding air flow to allow participants to feel more optimal respiration. Special thanks to Brijesh Patel for hosting and keeping everyone well-fed; models Brian Wolfe, James Pasquin, Matt Herhal, Andrea Goldberg, and Vasilina Sosnina-Waldron; reader Nicholas Buchta; and the A-list lab assistants Donna Behr and Miguel Aragoncillo who provided superb clinical pearls.